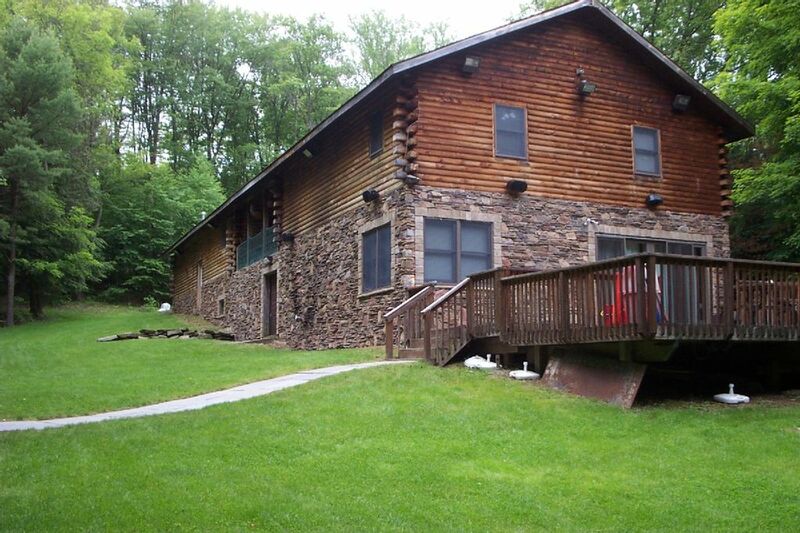 Our cabin was built to allow you to enjoy the best of Catskill living. Five minutes from Bethel Woods Performing Arts Center, 15 Minutes from skiing at Holiday Mountain, 15 minutes from swimming at Lake Superior, minutes from boating and fishing at White Lake and 15 minutes from golf and tennis at the Concord Resort. Relax on 2 acres of cleared yard with 3 decks, a horseshoe pit, volleyball court. Spend evenings in our large rec room, which has a pool table, large HDTVs and hot tub. 2 kings, 2 queens, 1 full, 1 set of bunk beds (full on bottom, twin on top), 2 queen pull-out couches. Pool table; foosball; computer with Internet access; 70'' HDTV; Karaoke player; basketball and volleyball court. There were signs when we first arrived that first night that we were less than pleased with. Everything looked a little worn and DIY in the 90s, and never updated again since. The igniters on the burners didn’t work, had to be manually lit. Outside lights were burnt out. The outside speakers didn’t work, and the air hockey table worked, but only scored on one person’s side, etc...little things, so we didn’t complain too much. But the next morning, there was no hot water. We called and were able to turn the water heater back on ourselves by gaining access to the garage, which I can see why they hide it from renters. Space heaters running 24/7 to prevent pipes from freezing, all surrounded by faulty wiring determined by one guest who is a contractor and property manager to be completely unsafe. Soon after the hot water came back on, the gas ran out, right in the middle of trying to cook breakfast. Once the propane guy showed up, it was late afternoon, but it wasn’t that evening until it got cold. Really cold. The pellet stoves ran 24/7 but we noticed then that none of the baseboard heaters worked and the bedrooms were freezing at night. We tried everything in the book of instructions, and then the last day we were there, the pellet stoves ran out of pellets as well, so we packed up and left as quickly as we could. The worst part, is the Sunday football we all came to the house watch together was ruined when the Direct Tv went out in the middle of Overtime of the afternoon game and never came back on again. We have pictures of broken spokes in the balconies where toddlers or small dogs would be completely unsafe, and grease spills and mold growing on and around the grills that vermin had clearly been eating. I asked for a partial refund to compensate for the many inconveniences we dealt with over the course of three days, where we basically took care of this house for the owner and left it in better shape than when we arrived. The owner refused. In good conscience, I have to share this info to warn potential renters. It’s unsafe. We wanted to like this place so much, and in its former glory it was probably something special. But it has been beaten up and poorly maintained, and it shows. Overpriced for what it truly offers, a series of major inconveniences. Rent elsewhere. Let me start by acknowledging that yes, the igniter on the stove is not working, there was grease on the grease mat under the grill, there was a broken spindle on the side deck (which has been repaired) and it took about two hours for the gas company to make a delivery after your call. That being said, these minor inconveniences do not amount to the full refund that you demanded in exchange for not posting a negative review or the 50% that you said you would settle for after your first attempt to extort us was denied. My group had an absolute blast staying at this house, it was enormous and had so much to offer! There was more than enough bed space, the basement offered so many fun activities, and even though we came on a weekend with bad weather and didn't spend much time outdoors, I did appreciate what was provided in the yard and on the deck as well. We will almost certainly be back! Glad your group enjoyed themselves and I hope the next time you rent the weather is better and you can enjoy hanging out outside. We had a great bachelorette party weekend at the house! Less than 10 minute drive to Bethel Woods and the distillery. 5 minutes to White Lake, restaurants and bars. The house is quiet and tucked in the woods... would be great for families, too. Backyard is awesome! What a wonderful house! This house is fully loaded. There is something for everyone here from young to old! Craig was a pleasure to deal with and made sure everything was perfect. We were a large group of 10 adults and 5 kids and it still felt spacious and secluded. We will definitely be back to rent this house again! Craig was an amazing host, very accommodating and there to answer any questions we had. The house was beautiful, very private with all the amenities you could think of. Everything was organized and anything we needed was right there. We would absolutely rent this house again in the future. I can’t thank Craig enough! yard is great, house is great. good for groups. 15 min. from Holiday Mountain, Lake Superior, WoodStock festival and 45 min. from Woodbury Commons. Rates for groups of 13 people or less, larger groups pay a little more. 1 night $ 800 Weekend $1500 Extended Weekend (3 nights) $1900 Extended Holiday weekends $ 2000 Weekly $ 2800 In addition, there is a 5% lodging tax and a security deposit of 1/2 rental fee.